This is “the season of of mists and mellow fruitfulness” even in the city. This week a friend invited me to go foraging for pears in Harehills, Leeds. A near neighbour of his has an overgrown pear tree laden with pears in his garden and my friend had got permission to pick as many as we wanted. When we got there with ladder and baskets the strong winds that we have had this week had already done some of the work for us and so we were able to pick up the windfalls but there were still a considerable number up aloft. The tree is desperately in need of a good prune so spaces between the branches were few. My friend, a bit older than me (sorry D! 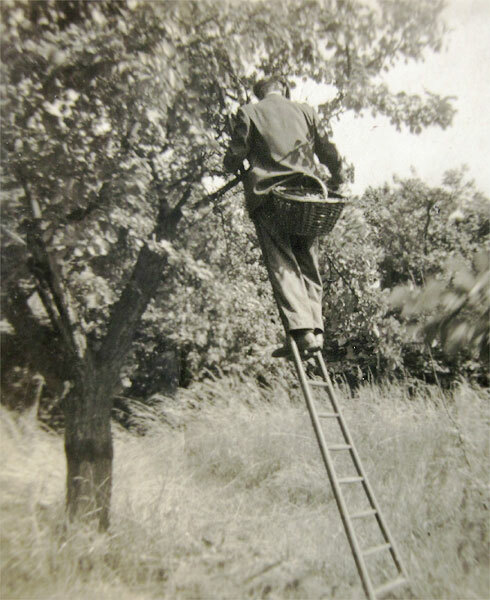 ), positioned the ladder against the branches and climbed up where I would have thought twice about going and filled a basket in no time at all. My turn came, I dismissed all my risk assessment tick lists and fear of heights and climbed up to pick the few that I could. We now have a load of pears. Some of the fallers have already been stewed and have found the breakfast cereal bowl. Some have gone into the flapjack and are delicious. Our next plan is to use some to make pear wine. Which brings me back to Keats poem “To Autumn” (yes, that’s where the mists quote comes from). It’s over half a lifetime since I last read it and re-reading it is very moving. I don’t pretend to understand all of it – I’m a scientist – but I would recommend it to you at this time of year. And if you don’t recognise the images he paints in his poem then get out into the country (or the city centre) and find them before it’s too late for you or the world. If you want to read Keats’ poem “To Autumn” just Google it! This entry was posted in Food, Garden, Half farmer, half X. Bookmark the permalink.